I have often been told I am an ‘Italian food purist’ or even, well, a snob, and maybe that’s true, because it’s physically painful to see menu items called ‘Cajun chicken creamy pasta’. My heart. I don’t think chicken and beef belong on pizza and I believe sliced jalapeno should stay as far away as possible from my penne. I will admit that this is a little hypocritical. I have no problems scoffing down California Rolls and won’t turn down a plate of delicious sushi because it has mayo in it. Or passion fruit puree, for that matter. In the darkest, loneliest nights of revision time as a student, when my fridge was empty and I had to scavenge every corner of my tiny kitchen to put together what could pass as a meal, I would occasionally gorge on Korean rice dumplings with Croatian ajvar sauce, or munch on pilau rice with soy sauce and prosciutto. I won’t judge you for adding kimchi to your hot dog, either (in fact, can I have some? I love kimchi). So I should be ok with Anglo-Italian food, right? Beeep. Wrong. Sorry, Nigella, I love you dearly, but your Marmite spaghetti haunt me in my darkest nightmares. And my soul hurts when I see that gloopy, overcooked mess that many pubs, restaurants and households in Britain call ‘spag bol’. Even the name makes me shiver. Spagbol. Sounds like something you would fish out of a can. A little bit of background: Spag bol is actually a rendition of one of my favourite Italian dishes, a hearty pasta dish with a rich, meaty sauce traditionally made out of a mixture of slow-cooked ground meats. 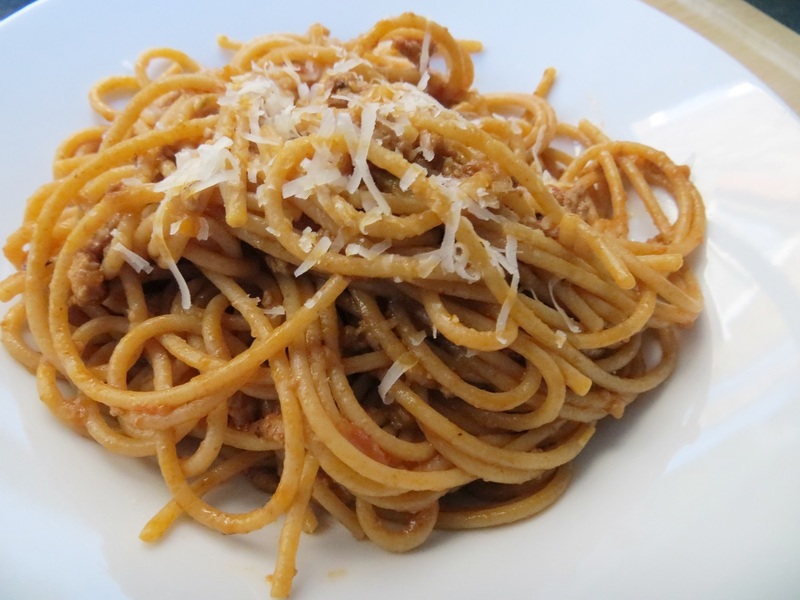 The sauce, called ‘ragù alla Bolognese’, is traditionally served with fresh tagliatelle rather than spaghetti – in fact, the regional cuisine of Emilia-Romagna relies on fresh egg pasta rather than dried pasta, the latter being a staple in southern Italy. If you were to google ragù recipes, you’d find billions of them. Some use mortadella, pancetta, even prosciutto; others boast cream and milk; there is white wine, red wine, beef stock. The cooking time tends to be long. Like, 3 hours long. Long. But the below recipe, which my mum has been making ever since I can remember, is much quicker*, easy, and delicious. It may still take longer than swiftly opening a can and pouring its soggy content into a bowl, but it’s worth it. Really. This is not a purist recipe; instead of using pancetta together with my ground beef, I love using leaner Italian-style sausage. This is something both my grandmothers used to do (but neither of them is from Emilia-Romagna, so I can’t really claim any sort of superior authenticity). The rest is incredibly simple – there is some chopping, some braising, some waiting around and watching the sauce bubble while being enveloped by the most amazing and comforting smell. This dish is a bowl of happiness and is the sort of food that can literally fix your mood. It’s perfect for rainy days or whenever you need extra TLC. It also freezes very well – I tend to make huge batches of it and simply defrost whenever needed. 2 cans of chopped plum tomatoes, plus some passata. Chop the onion, celery and carrots as finely as you can – you could even blitz them a couple of times in a mixer if you have it. In a heavy-bottomed saucepan, heat a couple of tablespoons of olive oil and add the chopped vegetables. Shallow-fry the mixture on medium heat for a few minutes, until they have softened. Increase the heat slightly and add the ground meat (for the sausages, you will have to cut them open and remove the film) and brown it for about 10 minutes. The meat will release some liquid; wait until this has evaporated before adding any other liquid. Once the meat is browned, you can add your red wine and canned tomatoes. If you want the ragù to be extra tomato-y, you can add some tomato paste as well. Add salt and pepper to taste and mix well, breaking the plum tomatoes with a wooden spoon. Partially cover the pan with a lid and let the ragù bubble away on medium heat for at least an hour. This keeps getting better and better the more you cook it, so you could leave it going for longer: just add some liquid (passata or even water) if it looks a bit dry, and give it another stir. Traditionally served with tagliatelle, ragù is also lovely with spaghetti, short pasta, in lasagna or cannelloni or with gnocchi. You can add herbs if you want (I love a bit of basil in it) and you can experiment with the meat. If serving this with pasta I recommend mixing the cooked pasta and the sauce together in a pan, rather than spooning the sauce over the pasta. This prevents te pasta from going sticky and it means that the flavours mix better together. *quicker, not quick. Any recipe that promises a cooking time of less than twenty minutes will lack flavour, complexity, depth.